Note above that there are now two secondary tabs above the audit data itself. 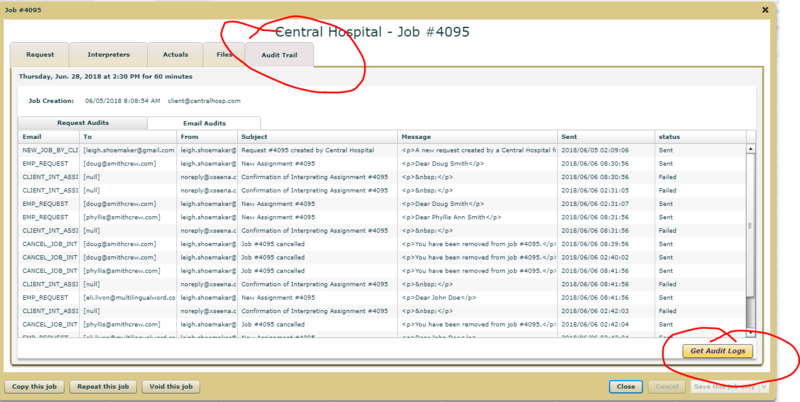 The left one, "Request Audits" displays the audit information as usual, but the right one, "Email Audits" is new info. If you click it, you will see the email messages that have been sent concerning this Job. The first column shown is the name of the Email Template used for the message. To, From and Subject are self explanatory, but the Message column may not always be easy to understand. Many of the email messages are sent using HTML (HyperText Markup Language) which inserts configuration marks around text in the body for spacing, color, underlining and such. You will usually not need to read the body, but if you do, you can hover over the message and a tool tip will show the full body and you can click it to copy it to the clipboard. You can then use any HTML editor to see how it renders. The final column shows the date and time the message was sent. This will be great when you get those excuses from interpreters who say, "I didn't receive any email." You can show when it was sent and they can talk to their email provider about why they did not receive it.